DfE plans to publish 2016 finance date by the end of this month (February) and additional 16-18 data and absence data by the end of March 2017. Clicking on an individual school’s name brings up more detailed information, including; the percentage of pupils achieving C grades or equivalents including English and mathematics, the percentage of Key Stage 4 pupils achieving the English Baccalaureate (Ebacc – a performance measure which recognises where pupils have secured a C grade or better across core academic subjects including English, maths, geography or history, the sciences and a language.) and the school’s progress 8 score (how a school is performing nationally in terms of seeing students’ progress in eight core subjects from primary school to secondary)Â . The individual school pages also display the school’s location, as well as the total number of pupils sitting exams last year. Students across the country continue to do better in their exams, withÂ 57.4 percent of pupils achievingÂ 5+ GCSE A*-C (including English and Maths), up from 57.1 percentÂ in 2015. Independent schools continue to perform poorly in the tables, with 62 percent of them coming in the bottom third of schoolsÂ for 5 A*-C including English and maths.Â However,Â this can be explained by the fact that many students in independent schools sit IGCSEs which are not recognised by the Government. This has caused a level of upset among leaders at some of the country’s leading schools. The now long-running divide between boys and girls continues, with boys on average scoring -0.17 individually on Progress 8, while girls achieve 0.11 – bettering theÂ national average when both sexes are calculated together. 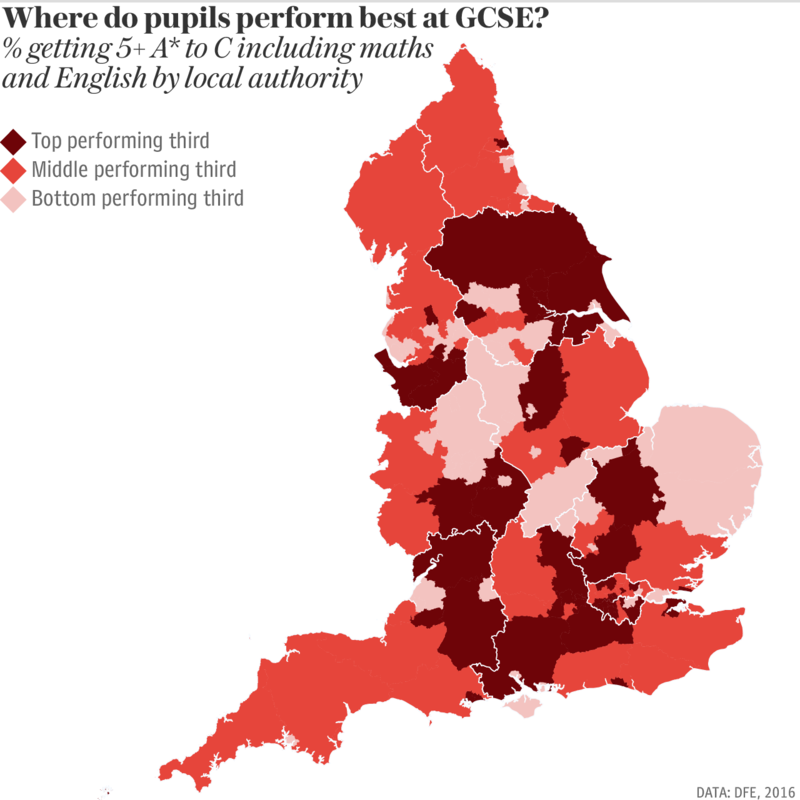 In terms of where students perform best the following table shows in interesting picture – with the east and certain midland areas performing in the bottom third. Kingston upon Thames was ranked the best local education authority in the country for the percentage of students obtaining 5 A*-C grades, followed by Trafford, Rutland, Sutton, and Kensington and Chelsea. Inversely, Knowsley in Merseyside was ranked the worst LEA in the country – both for the percentage of students obtaining 5 A*-C grades and for Progress 8 scores. All six schools in the authority have negative P8 scores, meaning they are all performing below the national average. Navigate work with a range of schools, local authorities and multi academy trusts to provide school improvement services, with a track record of improving outcomes at all key stages.